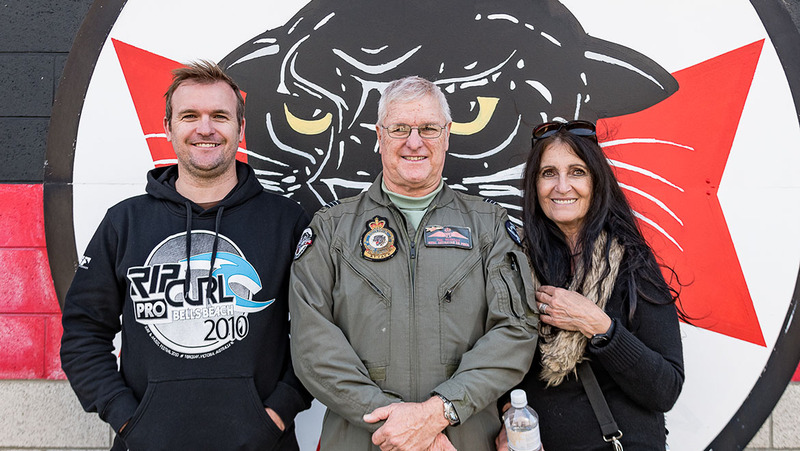 Squadron Leader Phil Frawley retired from the RAAF at the end of June, concluding a long flying career in which he’s piloted everything from Mirages, Hornets and C-130s to Fokker DR1, P-40 Kittyhawk and Grumman Avenger warbirds. Six months more and he could have made a full half century in the RAAF and maybe 500 RAAF pilots trained. He’s had to settle with 499. 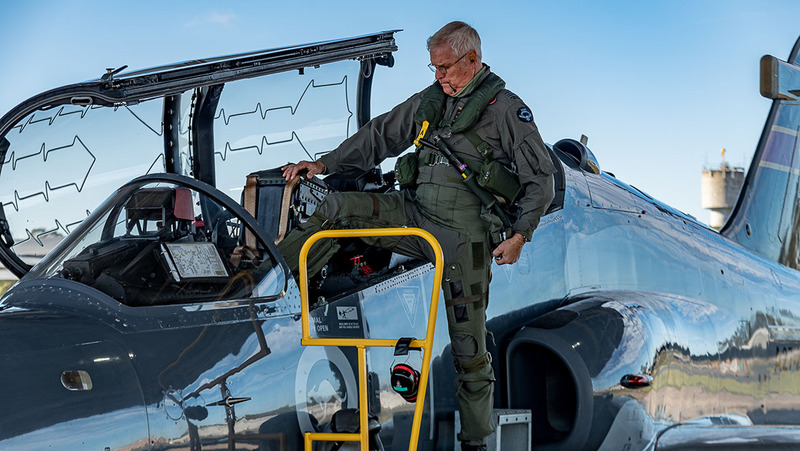 Right up to the last day, he was fully qualified to fly fast jets and at age 66 that made him the oldest serving fighter pilot in Australia and likely the world. As at August 1 last year the Guinness Book of World Records acknowledged Squadron Leader Phil Frawley, then 65, of Newcastle, NSW, Australia, as the world’s oldest active fighter pilot. A year older, Frawley, who goes by the moniker Frawls, said he planned to try to update that record. Reflecting on fast jets and young pilots, he said of all the fighters he’s flown, the standout was the MiG-21, the Soviet-designed supersonic fighter and interceptor which first flew in 1956 and which remains in service in mostly third world air forces around the world. A total of 11,496 were made, most in the former USSR. “When I was flying Mirages we were told they were hunks of junk and not really worthy of being an adversary,” he told Australian Aviation. Because so many were made and subsequently sold off as former Soviet clients updated their air forces, a significant number of MiG-21s have found their way into private hands. There are more than 40 in the US, a couple in Australia, including one at Fighter World, Williamtown, which he used to fly. Frawley said spare parts are easy to obtain but it was not an easy jet to master. “It’s very very manly, that’s for sure. Only my Mirage experience helped me through the process of training on it,” he said. “I was trained by the deputy chief of the Slovakian air force. Of all the pilots he’s instructed, just one stood out as an absolute natural and he was not an Aussie, but a Saudi Arabian. That was during a five-year contract to train Royal Saudi Air Force pilots on the Hawk lead-in fighter. “He flew the aeroplane way better than I could. He was amazing. I have never seen anybody quite like that,” he said. “There are a lot of gifted people who come through onto fighters, naturally enough because they are selected that way. To be the instructor of a guy like this guy was absolutely amazing. 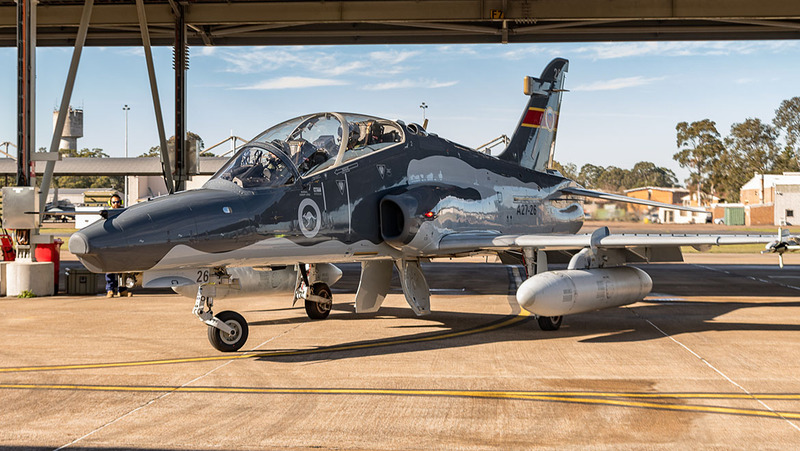 After returning from Saudi, he returned to the RAAF as a reservist with 76 Squadron at RAAF Williamtown, instructing on the Hawk. His thoughts on young Australian pilots? “There has been a slight downturn in the standard because we are not getting as many recruits for pilot training,” he said. But in terms of basic flying skills, some still encountered problems from time to time. “The way the training regime is in the Air Force now, we put a lot of effort into making sure they come up to speed. If they need remedial training we give it to them” he said. “The Air Force invests a hell of a lot of money in these young people and to get them to a certain level in their training and then decide we don’t want to continue with them any more is really nonsensical. It is not economical. The RAAF has just graduated its first two female Hornet pilots, assisted along the way by Phil Frawley. “They were two different personalities but both very determined. As far as I am concerned having females on fighters is fine. There is no problem with it whatsoever,” he said. Frawley said he was very proud to have trained 499 Australian Defence Force pilots. “I didn’t click over to 500 which is unfortunate but that’s alright,” he said. Like many youngsters growing up in the aftermath of World War 2, he developed an early passion for aviation. “My stepfather was in the RAAF during World War 2 as an armourer. He was on a pilot course when the war ended and he was demobbed and didn’t complete the pilot course,” he said. His stepfather and an uncle remained deeply interested in aviation and his first flights were aboard small civil light aircraft. He joined the RAAF initially as an apprentice instrument fitter, with two and a half years at Wagga and the same at RAAF Williamtown where he studied at night school to attain the qualifications necessary to enter pilot training. He began pilots course in 1974, learning to fly on the Winjeel. “That was the first aeroplane I was serous about flying. It was the only aeroplane without an onboard computer with a mind of its own. There were times when you felt you were just a passenger,” he said. He flew C-130 Hercules for five years, starting on A models and then the brand-new H models. “From there I applied to go to fighters and I was lucky enough to complete my training on the Mirage,” he said. As the Mirages were phased out he went onto F/A-18 Hornets. “It was a lovely jet but going from Mirage to Hornet, second-generation to a fourth-generation aeroplane was a huge leap,” he said. Alas, he’ll never get to fly the F-35, a true fifth-generation platform and a quantum leap for the RAAF as was the transition from Mirage to Hornet. He has though flown the simulator, which he said was amazing. “I don’t think my brain space has got enough left in it to cope with something like that. Naturally enough being a fighter pilot, I would love to have a go at it, but it’s not going to happen,” he said. “The thing about the aeroplane is it’s so secret. The press only gets snippets of information and a lot of it isn’t indicative of what the aeroplane is capable of doing,” he said. Flying the RAAF Museum’s Fokker DR1 Triplane and then its CAC Sabre opened the door to Frawley’s considerable warbirds flying experience. “As a result of that people got to know me and I subsequently flew the the Fiat G59 Italian fighter – it’s like a Mustang – the P-40 Kittyhawk, T-28 Trojan, TBM Avenger, L-39,” he said. He also flew the MiG-15 as well as the MiG-21, the Polish Iskra and the Chinese Nanchang. 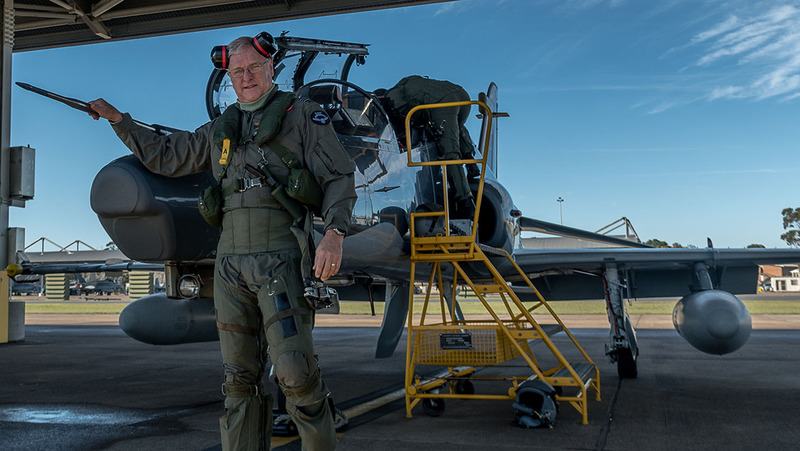 Post-RAAF, he will continue to fly the Czech-built L-39 Albatros jet trainer, for which he’s a Civil Aviation Safety Authority training authority. 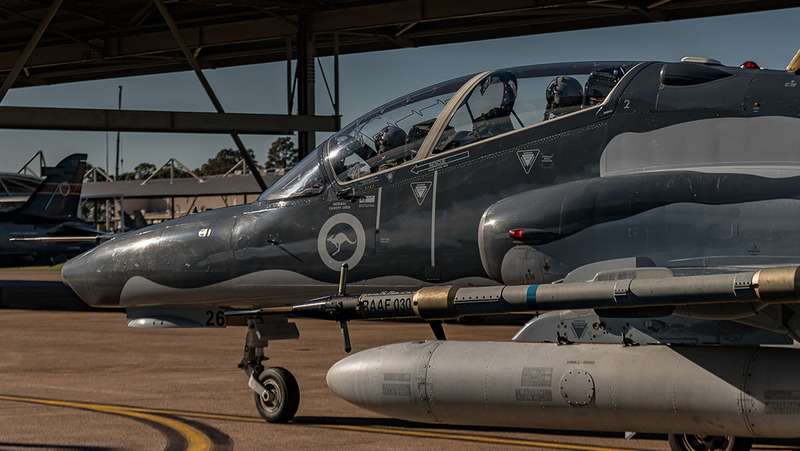 So if you’ve ever fancied a ride in fast jet, you can do so in a L-39 with Frawls at the controls through Jetride, which operates out of Cessnock in the NSW Hunter Valley. Right now the RAAF is rolling out a new fitness regime across the Air Combat Group and 76 Squadron to build up core strength to deal with the bane of fighter pilots’ neck and back problems from flying high Gs with a heavy helmet while maintaining constant watch for hostiles. Frawley said this was essential. “I suffer really badly from back and neck problems. With the new helmets and a lot of weight on the top of your head and pulling Gs and stuff like that, it is a necessity,” he said. “We encouraged it initially but it wasn’t compulsory but now it’s pretty much compulsory. It will avoid a lot of neck injuries. Frawley says his back and neck problems are getting worse and that was one reason he was getting out now. “It is sad to a certain extent but I realise the time has come. Everything is overtaking me so it’s time to quit,” he said. With his final flight, he was given the traditional RAAF sendoff, kidnapped by fellow pilots, plonked in a chair then sprayed with champagne and coated with flour and eggs. Still this isn’t the end of his flying. He will continue to do the adventure flights with Jetride. And he’s crew chief for the Warby Motorsport bid to break the world water speed record, set by Ken Warby in 1978. That record, 511 km/h, has stood for the last 40 years. Warby senior has retired from further record attempts but is assisting his son David in the latest bid. No date has yet been set but it will be attempted where the last record was set, Blowering Dam in the Snowy Mountains. “I just help with the maintainers of the boat. That keeps me busy and it’s a wonderful thing to be involved with. I am really looking forward to him breaking the record,” he said. “We have had the boat up to 300km/h. Just refining the handling of the boat is what we are doing now and getting the balance right. Phil Frawley has been married to Kerry for 45 years and the couple have two sons and four grandchildren. Neither son chose a career in aviation – one is in IT, the other a policeman. “The youngest boy did a couple of lessons and he was very good. He had the aptitude but just not the drive or desire. I think over-exposure was the problem,” he said. Certainly Frawley senior has done enough flying for the two of them! This feature article first appeared in the August 2018 issue of Australian Aviation. Seriously, why on EARTH am I paying an annual subscription fee when you guys post half the articles on the website for free now! A waste of my money and I won’t be renewing later this year that’s for sure. I’ll just keep checking the website for all the content for free. Thanks for the feedback we really appreciate it. Rest assured less than 20% of our magazine content is published on the feature section of our website. From time to time if there is a timely piece we’ll publish it online. Today we posted last months feature on Phil Frawley as we believe he is one of the greatest role models in aviation and his retirement from the RAAF deserved the widest distribution possible. As a member you’ll always receive fresh content a week before we go on sale in the magazine and months prior to select features posted online. Once again thanks for your feedback and your loyal support.